With a foreword by Walt's daughter Diane Disney Miller, Vault of Walt: Volume 1 is your chance to roam the nooks and crannies of Disney culture in the capable hands of Disney historian, master storyteller, and former Cast Member Jim Korkis. As Diane Disney Miller herself writes, Jim's stories are "...authentic, so true to my dad's spirit, so unprejudiced and non-judgmental, that I ... could see the twinkle in dad's eye, hear his laugh". 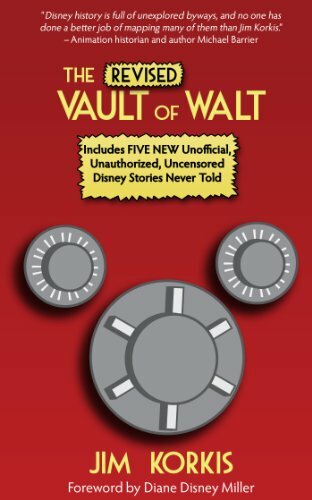 Vault of Walt: Volume 1 consists of four parts, each with seven memorable tales about Walt, Disney films, Disney theme parks, and the many other worlds of Disney. In addition, there's a bonus section about Disney's controversial film Song of the South to herald Jim's new book, Who's Afraid of the Song of the South? And Other Forbidden Disney Stories, also from Theme Park Press and now available on Amazon.